Sally Hurst (Bailee Madison), a lonely, withdrawn child, has just arrived in Rhode Island to live with her father Alex (Guy Pearce) and his new girlfriend Kim (Katie Holmes) at the 19th-century mansion they are restoring. While exploring the sprawling estate, the young girl discovers a hidden basement, undisturbed since the strange disappearance of the mansion's builder a century ago. When Sally unwittingly lets loose a race of ancient, dark-dwelling creatures who conspire to drag her down into the mysterious house’s bottomless depths, she must convince Alex and Kim that it’s not a fantasy—before the evil lurking in the dark consumes them all. Download Don't Be Afraid of The Dark in Digital HD from the iTunes store. 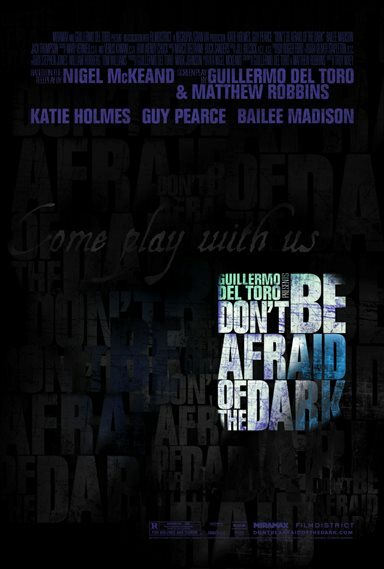 Don't Be Afraid of The Dark images are © Walt Disney Pictures. All Rights Reserved. When it comes to horror and suspense, there are few directors who can truly nail the proper tone to get the best reaction from audiences. Guillermo Del Toro has made a career of accomplishing just that. His latest film, which he wrote but didn't direct, is something of a passion project. When he was a child he watched the telefilm Don't be Afraid of the Dark and it had a profound effect on him. He spent the rest of his life attempting to recreate that same sense of terror and suspense that he felt as a child watching that film. The remake stars Katie Holmes, Guy Pearce and newcomer Bailee Madison as young Sally who unleashes an ancient evil within her father's home. As the film opens Sally is just arriving at her father's new home, Blackwood Manor. He and his much younger girlfriend Kim (Holmes) are in the midst of renovating this old and stately mansion. It seems more than a century earlier Emerson Blackwood and his son mysteriously disappeared, somehow leaving the home ghost-free but the monsters that snatched them up have been trapped deep within the bowels of the estate. From the start the script gives the audience the benefit of the doubt by allowing them the knowledge of the home's sordid history while the characters within are happily oblivious. The only person who does seem to have a clue as to what is going on is Mr. Harris (Jack Thompson) the grounds keeper, who made a pact with the demonic creatures though what that is, is never quite clear. It seems that Sally's arrival has awoken the monstrous beings that have a craving for, of all things, children's teeth. The director does a good job of keeping the creatures appearance hidden from the audience by using different techniques; utilizing audio of light whispers and glimpses of shadowy figures to imply their malicious intentions. When we finally do get a chance to see them it is built up slowly through a series of prolonged shots of glistening eyes glimpsed from behind heating grates, and claw-like hands scurrying within the air ducts. What makes their final reveal something of a let-down is the thick mythology built around the creatures. For instance, if they need to take "only one life at a time" then why do they wait so long to do so? They seem to abhor any kind of light and we don't know why, but in perhaps the most curious turn of events it is learned the creatures have something to do with the tooth fairy myth which only makes them come off more silly than scary. What is effective in the film is the dynamic between Sally and her soon-to-be-step-mother, Kim. The film calls for the two characters to start off as enemies eventually becoming allies when trying to fend off the nightmarish creatures. Their performances are sharp and engaging unlike Pearce, whom only comes off as very dull and uninteresting. Bailee Madison is the real gem here though, giving us a performance reminiscent of a young Drew Barrymore only with a darker undertone. While certainly not the best we have seen from Del Toro over years, the film does succeed in bringing about the shock value you can expect from any horror film. One scene in particular in which one of the creatures creeps into Sally's bed borders on the truly terrifying. The accompanying score only adds to the overall tension in the film and given the R rating it certainly aims at leaving the same scars any horror movie would on young children. If you're feeling like a good scare this weekend than you would be wise to go and see Guillermo Del Toro's newest film, if nothing else it will make you check your bed covers before sleep tonight.